Want to know a fun little fact about our house? Sure, you do. The original bathrooms are T-I-N-Y. Tiny, y’all. They are so small that I once hit my cheek on the towel rack while trying to sit down on the toilet in the powder room. I’ve always feared doing this and Mark always laughed and told me it would never happen. Well.It.Did. In our “master” bathroom (and the word “master” has never been used more loosely), you can almost reach the medicine cabinet from inside the shower. Not the kind of convenience you’re looking for. If my metaphors aren’t enough for you, here’s some cold hard numbers. 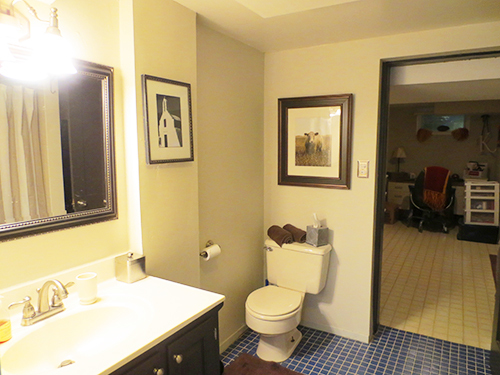 Total square footage for the two original bathrooms…a stunningly sparse 50 sq. ft. So we love having a third bathroom in the basement that alone is 56 sq. ft. While the bathroom is larger than the other two combined, it still hadn’t been renovated in 20+ years, so it needed some help. Here’s what it looked like when we bought the house. Not awful, but not great. You can’t really see it here, but the walls we covered in wallpaper that was literally peeling itself off, the faucet was old and leaky, and those lights above the mirror were way too bright. So about two years ago, we gave this guy a pretty decent face lift. 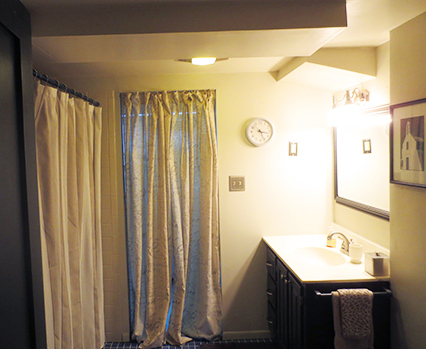 This picture has terrible lighting, but if you look closely you can see that we painted the door and vanity a deep, chocolate brown, stripped the wall paper and painted the walls cream, hung a new shower curtain and bath rugs and installed a new sink, mirror, and light fixture. We added hardware to the vanity and replaced the electrical covers with matched brushed nickel ones. Here’s a better shot of another angle. This project was long before the blog, so I didn’t keep track of what we spent, but it wasn’t much. We went with a pretty cheap sink and light fixture from Lowe’s. I would guess we spent between $300-$400 all told. I got the shower curtain from Sears of all places and the bath accessories are from Target. 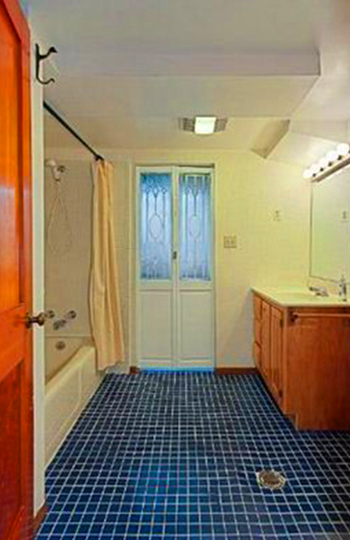 There were two things that this reno didn’t tackle. 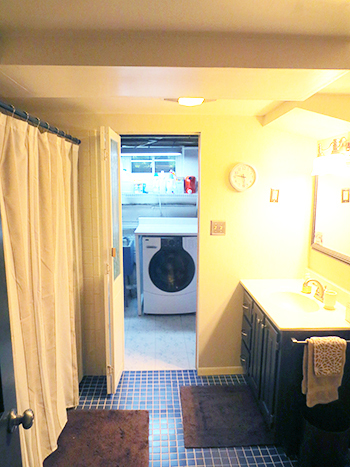 The blue tile floors and the bi-fold doors that lead to the laundry room. The tile (whilst not my fave) is in ok shape. There’s one tile right in the center of the room that is crooked and there’s no way not to notice it every time you’re in there, but that’s no reason to rip up an entire floor. Someday, I do plan on doing that, but my budget at the time and right doesn’t have room for a tile job, so the blue tile stays for now. The bi-fold doors, I have less of an excuse. I really just didn’t know what to do there. I mean these suckers are ugly. 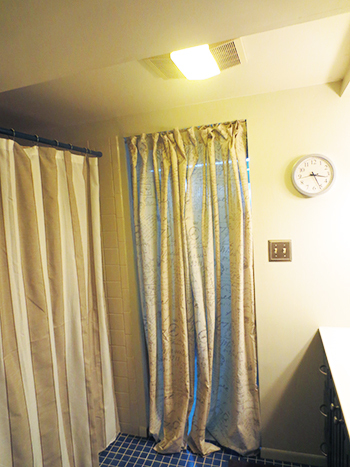 The laundry room, however, has a window so for privacy reasons, there needs to be a divider between the two spaces. One day recently, I decided that curtains were the way to go. I don’t know why I struggled so much with this because when I thought about it, curtains made perfect sense. When the actual bathroom isn’t in use they can be opened to let sunlight into the bathroom and basement and when the bathroom is in use, they are easy to close. I searched around a bit and decided that these curtains from Pier One would be perfect. Because I am a Pier One Platinum card holder and my birthday was last month, I got an additional 20% off, bringing my total for two curtains to about $50.00. I picked up a tension rod at target and got to hangin’. Whaddya think? Better right? They are the same tones that are in the shower curtain, but I think the soft horizontal cursive script is a nice contrast to the structured vertical stripes. Here’s a shot of the whole room. I think we’ve come a long way from here. One day we’ll re-tile the floor and replace that hideous ceiling light, but we’re all about baby steps around here. It’s all our minds and pocketbooks can take! Happy Friday everyone. We still have family in town through the weekend, so the sun room continues to stay “as is” for now. I will be back next week with a fun post about a little party we’re throwing this weekend as well as some other good stuff.